Use this printable measuring tape to measure larger distances. The tape consists of two parts, which can be glued together. Also, there is an inversed measuring tape which can be glued to regular one to get a centered measuring tape of 48 inches. 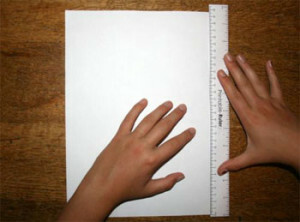 Hold a blank paper against your ruler as shown on the image. Letter sized paper should measure 27,94 centimeters or 11 inch vertically. A4 sized paper should measure 29,7 centimeters or 11,6 inch vertically.